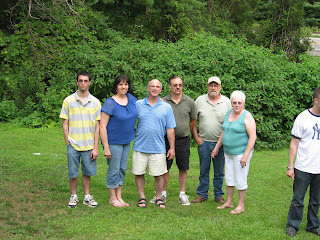 Here's most of my family at last year's Huntington reunion. Aaron, Michelle, Eric, Jack, Bruce and myself. I was just looking at last year's pictures and thinking 'how many will be there this year'. I'm hosting the reunion (my Mom's family) at Chenango Valley State Park tomorrow. We have 1/4 of Pine Plains Pavilion. Cousin Bobbie is already here from New Mexico and Belva is driving in from Ohio tomorrow. It will be wonderful to see both of them. Tomorrow is Michelle's birthday. Guess I'd better not say which one. She's bigger than me. I've been sewing strips, pressing, cutting into triangles and sewing into half hexs this morning. As I was pressing the half hexs I found a big bubble in one. So I did the stitch I am so proficient in, the frog stitch. Ripit, ripit, ripit. This Merry Go Round quilt is definitely going to be larger than the 61 x 68 inch one in the magazine. I think I have not repeated a fabric in the strips. Thursday night's game of Strip Poker at guild gave me some additional fabric strips to work with. Now I had better make breakfast before I hear the voice from below. Then off to do the Saturday errands.